I ♥: Catcher Citrus Reamer | eat. live. paleo. 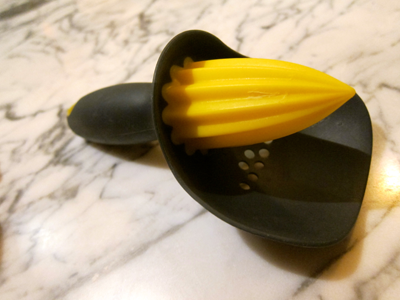 Here is a little kitchen gadget that I use all the time: Joseph Joseph “Catcher Citrus Seed Reamer and Pulp Catcher.” Since I often use lemon juice in cooking, this super simple gadget comes in very handy. I have an electric citrus juicer, too, but I find this handheld device is plenty for most lemon juice needs — plus I don’t have to bring out the electric juicer (bigger) and this handheld version is very easy to clean. Although some little seeds will slip through the sieve, I find this juicer a go-to kitchen gadget. Not sure where you live, but on the top right-hand corner you can click to change your country to EU or UK, too. Hope that helps!